We hit the dirt track and headed down south to the Chilean Border. Another hundred miles driving through barren landscapes that sporadically gave way to fascinating geological features. We crisscrossed through a large stretch of rococo carved rocks in an assortment of earth tones. According to our tour guide Sol, it was the bottom of an ocean millions of years ago. The rocks were formed from ancient coral reefs. Or simply put, it could have been ancient lava flow or a manifestation of extreme weather. 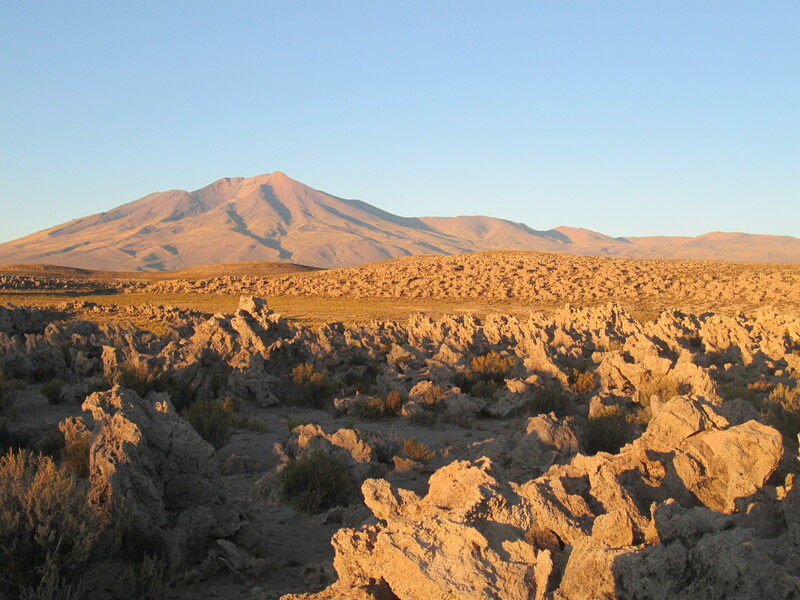 In either way, the bright sun reflected on the rocks as we zoomed past and puffed clouds of dust that scared the rocks off vicunas and sent them back into the mysterious rock formations shielded by large mountains and inactive volcanoes. In spite of that, we could clearly see the only active volcano, Ollague, spewing steam from a distance. What a clear day! Now that we thought we’ve seen all the flamingos in the Potosi region, we zoomed down Salvador Dali valley that once inspired Salvador Dali’s paintings which extended into the Siloli Desert. After doing much research, most accounts of Dali’s travel art inspiration in Bolivia is on travel websites. Official websites about the artist don’t disclose the ‘fact’. This got me curious. What was the deal? As a result, I developed an interest to scratch beneath the surface and learn more about Dali. It’s way too deep to dig into over a day. We were surrounded by sand dunes and were hit by hard winds, until we stumbled upon ‘Arbol de Piedra’, a stone tree, standing in isolation. There were a bunch of other rocks whittled by the wind that bore no resemblance to anything in particular. After 15 minutes, we meandered through the mountains and encountered a shallow sketch of surrealism. 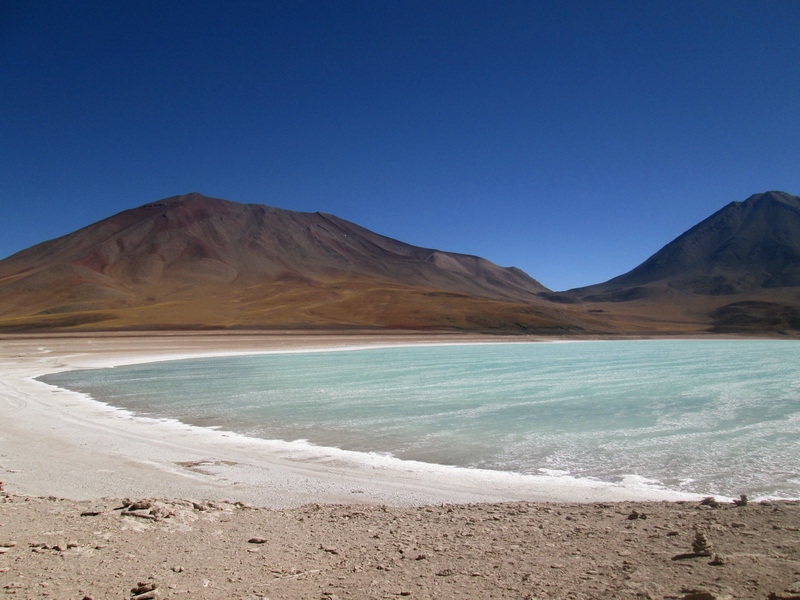 The bloody Laguna Colorada that ALSO inspired Dali. Stained in burgundy, it clashed with islands of white borax. After our picnic lunch, we headed to the highest point of our trip, 4900 meters, where reeking sulfur fumes rose out of a geothermal field. Sometimes mistaken for a geyser, Sol de Manana, is a pretty active and NOISY volcanic site with scattered craters that gushes out boiling bubbly mud. Eventually, I was pretty freaked out and ran back into the car. As we headed closer to the border, we made one final stop. Laguna Verde at the foot of Licancabur Volcano. Here, I measured my fitness level at high altitude when extreme winds yanked a couple of bank notes out of pocket (money I saved to tip Sol and the driver). I ran as fast as I could to pick up the flying notes. My sigh of relief converted into minutes of continuous heavy loud breathing I thought I was going to get a heart attack. Anyway, back to the lake. It’s rich in arsenic, which gives it the spectacular turquoise shade. This picture does no justice. Without a doubt, there were flamingos wading all around.